Does Your Child Belong in S.P.A.C.E. this Summer? to choose an individualized area of study. and on which s/he will create a report. who is an experienced and knowledgeable Ph.D. in Education. 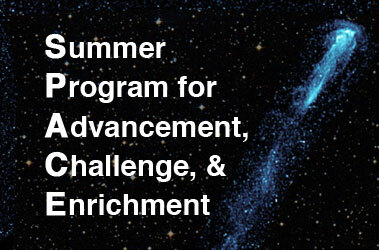 This extraordinary educational opportunity is limited to a maximum of eight students. The program is located at Kids Make A Difference headquarters, running daily from 9am to 3pm. After-school activities and an overnight (boarding school) option for this is available. Interview required to determine if you belong in S.P.A.C.E. this summer. Download the application and please e-mail or call. Our contact information is below.